After posting eight points in 12 minutes in the Dallas Mavericks’ 129-125 loss to the New Orleans Pelicans on Tuesday, Dirk Nowitzki surpassed the legendary Michael Jordan to move into fourth on the NBA all-time scoring list. After flirting with this accomplishment for quite some time, Nowitzki is happy to overcome all of the obstacles that have plagued him this season to move up the points ladder. “It’s been a long time coming this season, knowing before the year it was only 200-something points [away]. Then there were times when I thought I’m not going to make it, the way the season went with the injury. Coming off the injury was just super, super slow. 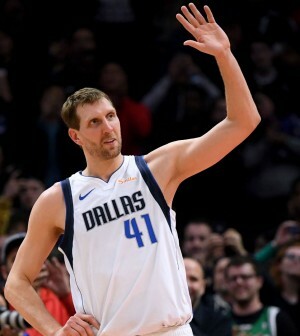 But the last few weeks felt better, and I’ve been playing better, and the team was obviously looking for me and telling me to shoot…I’m glad it’s over with now.” said Nowitzki. The 40-year-old German, who is currently playing in his 21st NBA season, has accumulated 31424 points in 1510 career regular season games. He has also won an NBA championship, NBA Finals MVP, an NBA MVP Award, and has been selected to 14 All-Star games during that span. Nowitzki now trails the great Michael Jordan by 868 points for fifth on the all-time scoring list.